The leaves are beginning to turn, so why not try an appropriately named drink for the fall season? Enjoy an Autumn Delight! There are other cocktails with this name, but this version originated in Japan, created by the makers of Tamazaki Whisky. Ideally, Suntory Yamazaki (12 year) is the whiskey that should be used. It’s more akin to a Scotch rather than rye whiskey. The art of Japanese Whisky began in 1923. See more about Suntory Whisky here. What you’ll need: Whiskey, Apple Cider, and Cinnamon. Pour 1 1/2 ounce of whiskey in a old-fashioned glass over cracked or cubed ice. 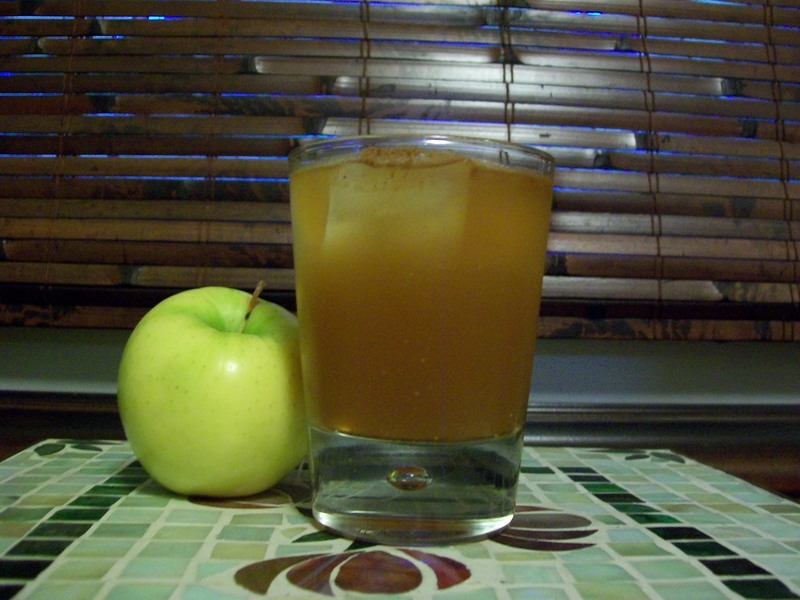 Fill the glass with (about 3 or 4 ounces) apple cider, chilled. Sprinkle cinnamon on top. Garnish with slices of apple or a cinnamon stick. This drink could also be served hot. Add whiskey and cider in a sauce pan, add cinnamon (optionally add cloves or nutmeg), then heat to a near boil and serve in a mug. How I like it: In lieu of Suntory Yamazaki Whisky, I used a blended rye whiskey. It won’t have the texture of a fine scotch, which could also be used as a substitute depending on the availability of Japanese whisky in your area. Also, I added about 1/4 ounce of lemon juice for a slight sour apple flavor. Though the drink pictured above is the chilled version, I’d prefer this cocktail served warm for those chilly autumn nights. 責任を持って飲む! In any language … Drink responisbly!